Located within affluent Morris County, New Jersey, Mt. Arlington Plaza offers local communities a mix of medical, financial, dining, and personal care services. The center boasts an abundance of camera secured, convenient parking spots and tenants benefit from close proximity to an established and growing customer base. Located within walking distance to the NJ transit train and bus station, it also has easy access to major highways. This family-oriented center, surrounded by a beautiful countryside, affordable homes, and the convenience of public transportation attract patrons from the Mount Arlington area and nearby communities including Ledgewood, Landing, Lake Hopatcong, Netcong, Kenvil, Mine Hill, and Wharton. Notable neighbors in the area include Cracker Barrel, Holiday Inn, and QuickChek Convenience Mart and Gas Station. 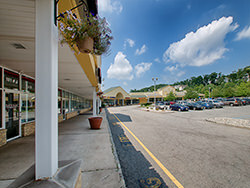 If you are interested in this location: Download our complete marketing guide for Mount Arlington Plaza by clicking the link below.